It’s hard to believe that Elvis Presley has been gone for so long. August 16 is the anniversary of his death in 1977. That day a sense of disbelief overwhelmed Elvis fans like me. How could it happen? Why didn’t we see it coming? In retrospect, we know that Elvis’s health was unstable for several years leading up to his passing. And yet, he kept up a personal appearance schedule that would have taxed the energy of a much healthier, younger man. 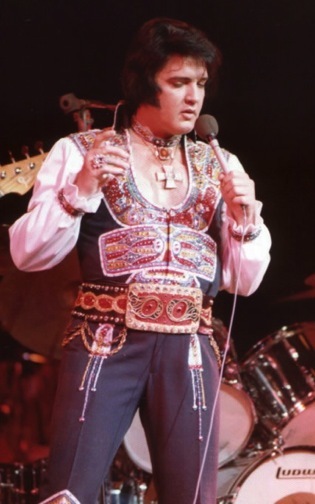 Between mid-March 1976 and the end of June 1977, a period of less than 16 months, Elvis spent a total of 141 days on tour around the country, plus engagements of 10 days in Lake Tahoe and 11 days in Las Vegas. During breaks in the grueling schedule, Elvis dealt with legal problems, stressed relations with fired employees, and recurring health issues. Many reviews of his stage shows during this period provided clues to his deteriorating condition. Unfortunately, Elvis was moving too fast from city to city for the public to put the puzzle pieces together. • "Elvis is fine, period"
• "He seems to have matured into a sensitive artist"
With all the past angst about his weight gain, it was heartening to read Connie Trexler’s description of Elvis on October 26 in the Fort Wayne News-Sentinel! The next night, Elvis was unable to go on stage in Baton Rouge. 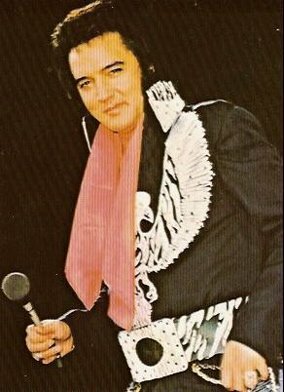 Sold out shows in Mobile, Macon, and Jacksonville were cancelled, and Presley returned home on April 1 and checked into Memphis Baptist Hospital. Four days later he went home, and, incredibly, by April 21 he was back on the road for shows in 11 cities over 12 days. “There comes a time when a performer should retire for the sake of his fans as well as for himself. I’m sad to say Elvis Presley has reached that time. 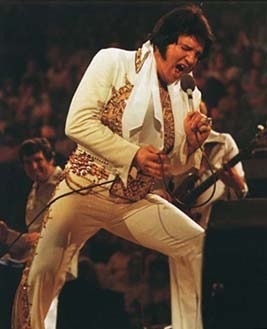 Reports of recent Elvis concerts have been disheartening indicating that the King of Rock ’n Roll is dead. 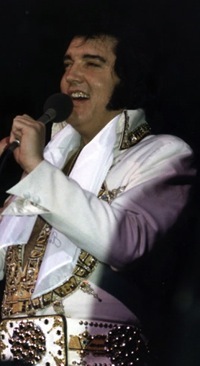 Apparently the reports are founded upon truth, and the King confirmed the suspicions with his listless, lifeless performance Saturday night at Cincinnati Riverfront Coliseum before another sellout crowd. “The King looked awful. Though loyal fans attending the concert with me insisted he has lost weight since last year’s concert, Elvis still has a paunch which could do a Santa Claus suit without needing padding. Ghastly pale, eyelids nearly swollen shut, Elvis tried to exercise his booty as in the golden years. I’ve seen senior citizens with better acts. • Could Elvis’s fans have saved him? So we come to the heartrending question that accompanies our memories every August 16th. If we had known everything described above, would we, Elvis’s fans, have done everything possible to save him? Sadly, it’s very doubtful. What Elvis needed in 1976 and 1977 was to stop touring and concentrate on regaining his physical and mental health. He deserves most of blame for what happened to him, of course, but we fans who saw him on stage in his final years will always experience a soul-searching dilemma. To save Elvis, would we be willing to erase our special memories of seeing him perform and hearing him sing? The only thing that would have kept him from the grueling tour schedule that surely contributed to his death would have been if we had refused to attend his shows. Not a chance of that happening. "There comes a time when a performer should retire for the sake of his fans as well as for himself. I’m sad to say Elvis Presley has reached that time. 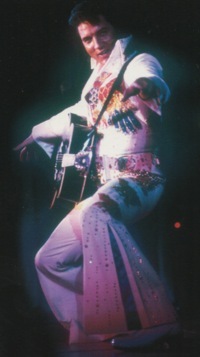 Reports of recent Elvis concerts have been disheartening, indicating that the King of Rock ’n Roll is dead."